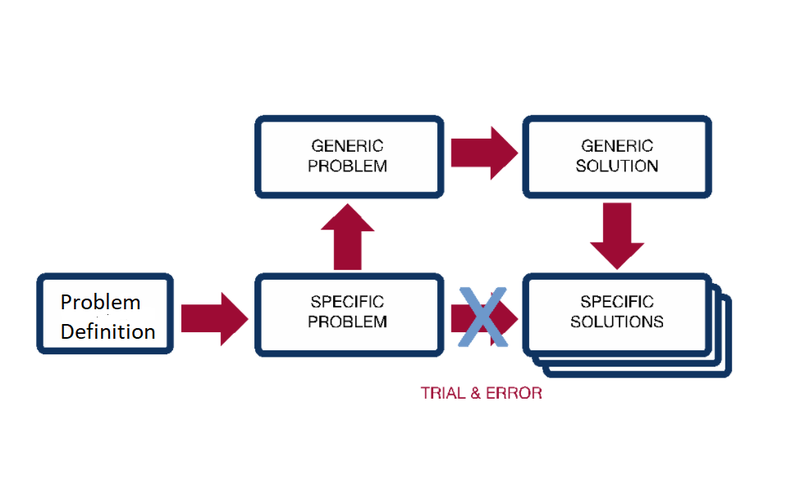 This blog is the first of three which aims to summarise and inform engineers, scientists and senior managers about Triz. Triz is one of the most underutilised, misunderstood yet most powerful tool available to solve problems. It was invented by a Russian called Genrich Altshuller over a 30-year period from the 1950’s to 1980’s and has only recently become more widely used in the UK and US. Altshuller was a patent expert for the Russian Navy. After World War 2 the patent library was given to the US and Altschuller wrote a critical letter to the Soviet Government saying that these were extremely valuable and should not have been given away. For his outburst he was arrested and sentenced to 25 years in prison. Now, we've all probably sent an email that we later regretted, but that was harsh! He was released in 1954 after the death of Stalin and started to analyse patents to see whether it was possible to devise a repeatable methodology for invention. From this work he formulated Triz. Triz (pronounced trees) stands for “Teorija Reshenija Izobretatelskikh Zadach” which translated means the “Theory of Inventive Problem Solving”. He analysed over 2 million patents and concluded that almost all of them (99.7%) used already known solutions. Therefore, he reasoned, if you can access known solutions you are extremely likely to be able to invent something to solve your particular problem. He noted that the typical way to solve a problem was by trial and error. You have a specific problem and you look for specific solutions by brainstorming options. However, with the realisation that almost all solutions are already known he suggested that you look at generic problems and generic solutions instead. After all, someone, somewhere WILL have solved a problem similar to yours. The issue being that you don’t know about it yet. Do not try to find a solution to a problem by trial and error brainstorming. A breakthrough solution is a result of overcoming a contradiction. Inventors and strong thinkers use common patterns. Creative problem solving patterns are universal across different areas. Evolution of man-made systems follow recognised trends. In summary, new innovative ideas can be produced by reusing previous experience and the patterns of previous solutions. This is the rationale for our Idea Catalog. This is a collection of technologies, from many different industries, that have been categorised to help with identifying potential solutions based on already known solutions. Please register to see how it can help to prevent "reinventing the wheel" or to build on what others have already done. Sign Up Here. Triz has had a slow and difficult start in the West. When it arrived its advocates promoted it as the only tool you’ll need. It was guaranteed to be able to solve all of your problems. Unfortunately, it was quickly seen that it is fiendishly complicated (the terminology translated from Russian was obscure) and most of the tools were extremely challenging to use without many years of training. It is also fair to say that the myriad of tools available are also rather incoherent. This means it is difficult to know when to choose one over another. All this has led to a methodology that is fragmented and difficult to use without considerable effort. It is not a topic you can learn in a two or three day course. It has to be studied and used in a practical way to take advantage of its huge potential. Thus, it’s not surprising that people tend to use much simpler methodologies such as Lean or Six Sigma. However, it is important to understand that neither of those tools actually help you solve a problem! They may help to identify the problem but offer no assistance for a solution. “Brainstorming” options is the only tool provided but this is a random search for a solution based only on the knowledge of those present. Not efficient and certainly not effective. That is why we believe Triz to be a fantastic methodology for solving problems. It is the only methodology that provides the team with ready made potential solutions - and since those are based on previous solutions it provides a good rationale for the choice. It both short cuts the time required for finding solutions and also broadens the selection by offering ideas that are significantly more than any one person could know. It does not mean that engineers and scientist no longer have to think! They have to turn the potential initial ideas into ones that are specific to the problem at hand. But it does mean that their intellect will be focused to result in a better solution than would otherwise be the case. For further reading, try Altshuller's book "The Innovation Algorithm" (Altshuller, 1999) which is a very good read for the historical perspective. My book, "Successful Problem Solving" (Seed, 2016) has a significant chapter on Triz covering a number of tools for its application for problem solving; and not just technical challenges. Both are available on Amazon. If you do not want to buy a textbook, then this blog will continue with a more detailed look at some of the most useful Triz tools in the next few weeks. With chapter on running effective workshops.